Each month a group of featured storytellers tell their story - all adhering (somewhat) to that month's theme. Would you like to be a featured storyteller or know someone who would be fabulous? Send us a message at info@volumesbooks.com! 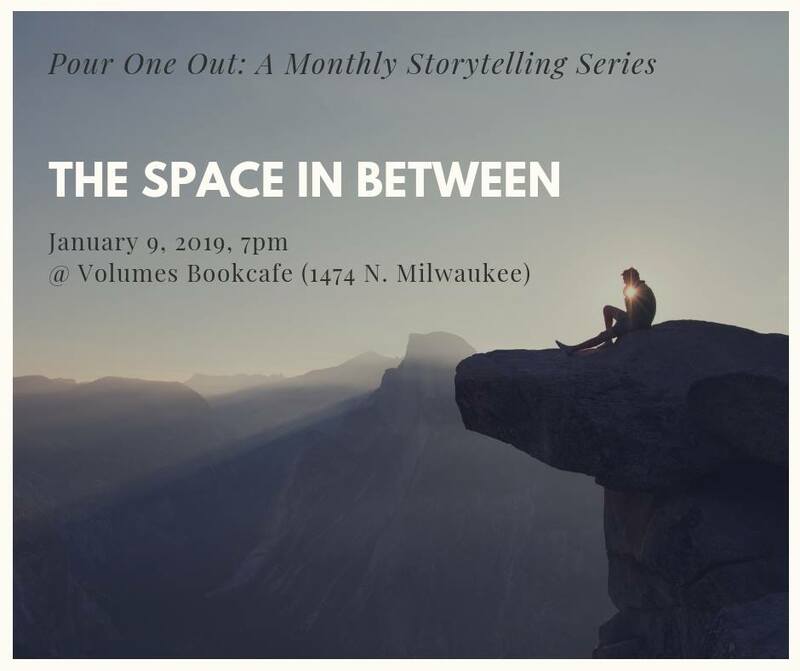 Join us on Wednesday January 9th for our first Pour One Out: A Monthly Storytelling Series in 2019. The show starts at 7pm. The theme is THE SPACE IN BETWEEN! What's this space in between? What does this mean? Members of different groups, including LGBTQ community, immigrants, refugees, people of mixed-race descent, minority communities, etc. have used this term to describe their experiences. "The space in between" is a state of existence and a state of mind. It describes a state of straddling, not fitting in, not belonging, either/both, neither/nor, or here/there. It is about ambiguity, ambivalence, and everywhere and nowhere. We have a fantastic lineup that includes Ines Bellina, Molly Brennan, Mack Dihle, Jonathan Euseppi, Keisa Reynolds, Chhun Singha, Tony Ho Tran, and Nancy Wai. These tellers will explore what this space means to them. They will use the above description as a starting point and take it from there. This will be a wonderful experience of sharing, dialoguing, and community building. What's your space in between like? Stop by to hear what they have to say and join this growing storytelling community at Wicker Park. Pour One Out is a monthly storytelling series curated and hosted by Ada Cheng! This is one of our favorite nights of the month - We HIGHLY suggest checking it out. Plus, it is a new year, so...try something new!